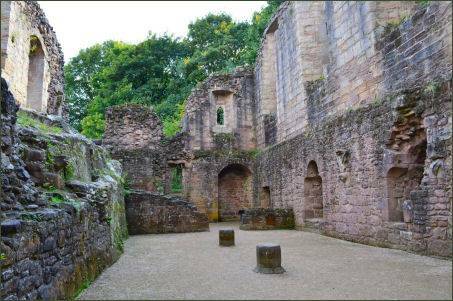 The ruins of Spofforth Castle, a medieval fortified manor house, stand in the village of Spofforth, in North Yorkshire. The castle belonged to the powerful and aristocratic Percy family, one of the most important and influential families in northern England. 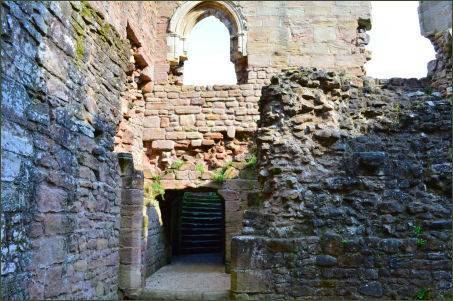 Situated on a small rocky outcrop overlooking the village of Spofforth, the ruins consist of the remains of the hall and solar wing of the castle which has some fascinating features including an undercroft built into the rock. The back of the building is set into a rock outcrop, so the rear entance leads directly onto the upper floor. 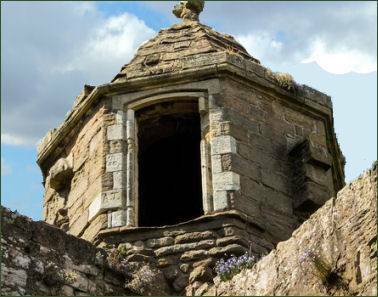 The most striking part of the remains is the corner turret, which still stands to its full height and still retains its roof. The remains of a row of columns and stone corbels on the west wall date from the fourteenth century, when a stone vault was added. At first-floor level the east and west walls were totally rebuilt during the fifteenth century with impressive windows in each wall. 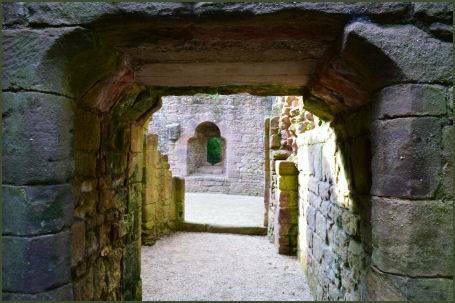 Spofforth Castle was originally an eleventh century manor house, founded by William de Percy (died 1096/9), the first of the great medieval Percy dynasty, he was nicknamed 'Aux Gernons', which meant the Bewhiskered. William came over from Normandy during the reign of King William the Conqueror, who granted him estates in the north of England. The name was taken from Percy, a fief near Villedieu in the Cotentin Peninsula in Normandy. Many of his Percy descendants were to bear the Christian name 'Algernon' in reference to the historic nickname. 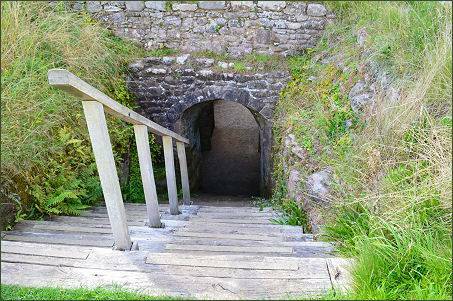 Percy accompanied Robert Curthose, Duke of Normandy, on the First Crusade, where he died within sight of Jerusalem. In 1125, William's descendant Richard de Percy (c. 1170-1244), 5th Baron Percy, and the rebel barons who opposed King John are said to have met at the Castle to draw up the provisions of the famous Magna Carta. Richard's estates were declared forfeit, however after John's death Percy immediately made his peace with his successor Henry III, and had his lands restored to him. Later generations of the family in the early thirteenth century, added a stone hall house, of which the undercroft still remains. Henry de Percy, 1st Baron Percy of Alnwick (1273–1314) was granted a licence to crenellate or fortify the house by King Edward II in the early fourteenth century. He purchased Alnwick Castle in 1309, which was later to replace Spofforth as the family seat. He was amongst the lords who rebelled against King Edward II over the issue of his favourite, Piers Gaveston. As a result de Percy was imprisoned for a few months. After his release, he declined to fight under Edward II at the Battle of Bannockburn, remaining at Alnwick, where he died a few months later, at the age of 41. 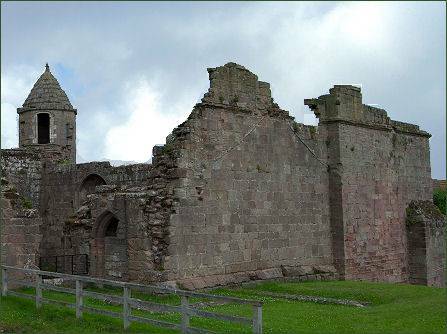 The famous Harry 'Hotspur' Percy (1364 – 1403), so called for his impulsive and fiery temper, was born at Spofforth Castle in 1364, He led a revolt in collusion with Owen Glyndwr against the first Lancastrian king, Henry IV. Joined by his uncle, Thomas Percy, Earl of Worcester, Hotspur marched to Shrewsbury, where he intended to do battle against a force there under the command of the Prince of Wales. The army of his father, however, was slow to move south as well, Hotspur and Worcester arrived at Shrewsbury on 21 July 1403, where they encountered the king with a large army. Harry Hotspur was killed whilst whilst leading a rash charge at the battle of Shrewsbury in July, 1403, when an arrow hit his forehead. Henry IV at first allowed Hotspur's body to be interred at Whitchurch. In response to rumours that he had survived the battle, his attitude hardened and he had it disinterred. Hotspur's body was set up in Shrewsbury, impaled on a spear between two millstones, and was later quartered, its parts dispatched to separate locations in the kingdom, his head impaled on a pike at the gates of York, a grim warning of the king's terrible retribution to others. 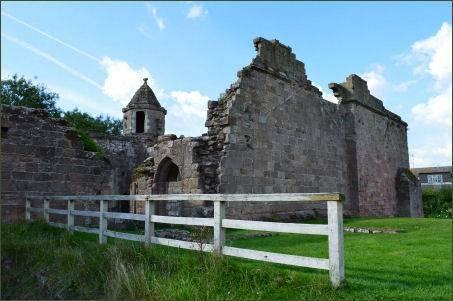 The Percy family lost possession of their estates, including Spofforth, when Hotspur's father, Henry Percy, Earl of Northumberland supported Richard le Scrope, Archbishop of York, in another rebellion against Henry IV in 1405, after which Percy fled to Scotland, and his estates were confiscated by the king. Henry Percy was killed fighting a furious rearguard action as his army was routed at Bramham Moor whilst in further revolt against Henry IV. His severed head was subsequently displayed on London Bridge. The power of the Percy family was shattered, the north of England became the domain of their political rivals and their estates were granted to Sir Thomas Rokeby, Sheriff of Yorkshire, who had commanded the royal forces in the battle. Harry Hotspur's son, Henry Percy, 2nd Earl of Northumberland (1393 – 1455) became involved in a feud with the powerful Neville family, on the outbreak of the Wars of the Roses, the Nevilles were closely associated with York, so the natural option for Northumberland was to side with the Lancastrian king, Henry VI. On 22 May 1455, at the First Battle of St Albans, the royal forces clashed with the forces loyal to Richard, Duke of York, in what has been described as the first battle of the Wars of the Roses. The battle was a complete victory for the Yorkist side, the king was taken captive. Northumberland was among the casualties, and was buried at the nearby St Albans Abbey. In 1461 Henry Percy, 3rd Earl of Northumberland along with his brother Sir Richard Percy, lost the lives fighting for the Lancastrian cause at the bloody Battle of Towton, a bitter bloodbath and a decisive Yorkist victory. The Yorkist Richard Neville, Earl of Warwick, known to history as 'Warwick the Kingmaker' advanced to Spofforth, plundered the surrounding countryside and burnt the castle. 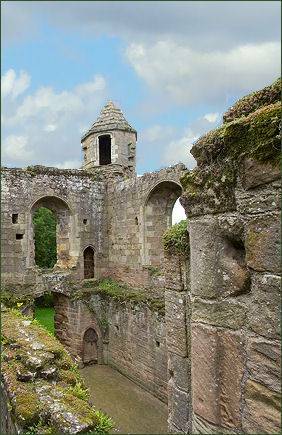 Spofforth Castle lay in ruins for nearly 100 years until 1559, when it was restored by Henry, Lord Percy. By this time, however, the seat of the Percys had shifted to Alnwick in Northumberland. Nine years later, the family estates were restored in 1473, to his son, Henry Percy, 4th Earl of Northumberland, who commanded the Yorkist reserve at the Battle of Bosworth in 1485, but never committed his forces to the battle. He received a pardon from the new Tudor king, Henry VII. In 1489, Sir John Egremont led a riot in protest at high taxation imposed by Henry VII, Percy was targeted by the rioters and lynched. He was buried at Beverley Minster. 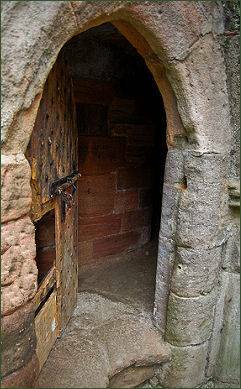 Thereafter Spofforth Castle remained neglected. In 1559 the building was restored by another Henry, Lord Percy, who made it an occasional home. The last recorded occupant was the castle steward Sampson Ingleby, who died in 1604. 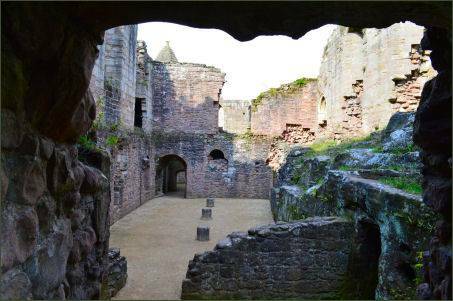 The building was briefly garrisoned by Parliamentary troops during the Civil War who later slighted Spofforth Castle. 3 1/2 miles south-east of Harrogate; off A661 at Spofforth.